There will be no crushed eggs, bread or lopsided bags to carry when you check out with the best grocery bagger in Maine. Alex Matos, 22, of South Portland, won the title – and a trip to compete for the national grand prize of $10,000 early next year – Sept. 26 at the Good Shepherd Food Bank warehouse in Auburn. Learn more via The Forecaster. 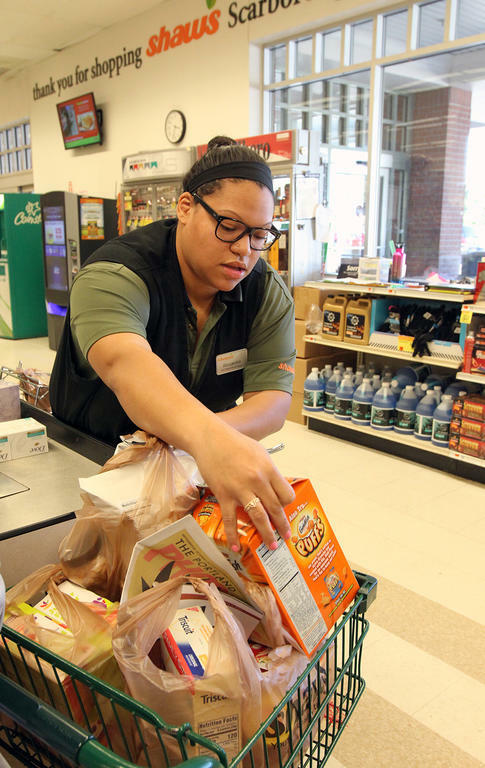 Matos will test her skills against the nation’s best baggers in the 2018 National Championship. Today, U.S. Sens. Mark R. Warner (D-VA) and Rob Portman (R-OH) introduced the bipartisan Commonsense Reporting Act of 2017 to streamline and modernize employer reporting requirements under the Patient Protection and Affordable Care Act (ACA). Learn more via Augusta Free Press. When Carlos Castro left El Salvador in 1980, due to the violence from the civil war in the Central American country, he never imagined that he would end up being a well-known entrepreneurial owner of Todos Supermarket in Woodbridge, a mere 30 minutes from the U.S. capital. Learn more via Abasto. He was a confidant of the future President Bill Clinton and with his wife twice met Prince Charles and Princess Diana. Not bad for “a couple of folks from Arkansas.” Mr. Oral Winston Edwards, 87, of Forrest City, Arkansas, passed away Sept. 29. A self-made man, Mr. Edwards founded GES Inc., which today operates stores under the Edwards Food Giant and Edwards Cash Saver banners. Learn more via The Shelby Report. Instacart, a national on-demand grocery delivery service, has entered into a partnership with Lowes Foods to bring same-day delivery to more than 350,000 North Carolina households in the Raleigh-Durham area. Learn more via The Shelby Report. National Cooperative Bank’s annual “NCB Co-op 100,” a report listing the nation’s top 100 revenue-earning cooperative businesses, which in 2016 posted combined revenue of about $208 billion, has included Wakefern Food Corp. and Associated Wholesale Grocers (AWG) among its ranks. Learn more via Progressive Grocer. With new investments and emerging technologies sparking a wave of innovation across the industry, grocery is evolving, not disappearing. In fact, the in-store shopping experience itself is proving to be irreplaceable, as 85% of shoppers say they prefer to buy goods in person. Learn more via Food DIVE. No doubt about it: Meal kits are growing in popularity. From their beginnings as items ordered over the internet and delivered to consumers’ doorsteps, they’ve migrated to grocery store shelves, with retailers such as Kroger and Publix offering their own versions. Learn more via Progressive Grocer. An online Reuters/Ipsos poll released this week revealed that 84% of adults think the government should require nutrition information labels on packaged food sold in grocery stores — and 64% want the same requirements for restaurants. Only 13% said they always read the labels when deciding whether to buy a product. Learn more via Food DIVE.